Aimtec’s power converters are offered in a wide range of Output Power and Output Voltages. This gives the opportunity to use them in a “stand-alone” configuration or connected in parallel or in series. To increase the Output Power capability on the supplying unit by connecting 2 or more converters in parallel. To provide redundancy and to ensure that the system remains functional should a single power module fail. The use of multiple power modules distributes the thermal heat load over a larger board area. Ideally, the modules should be connected in parallel as shown in Figure 1. In the parallel configuration illustrated, the total output power is shared by the two converters. Since the power may not be evenly shared between the two converters, it is recommended to use converters that have maximum rated output power of around 75% of the max load power. In this manner the stress level on either converter will not exceed its individual rated maximum. Example: if the maximum load power is 20W, two 15W converters should be used. 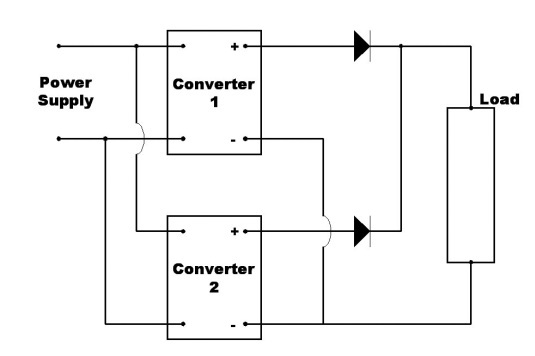 Ideally, the Output current will be shared equally between two converters, if they are identical. If one or more parameters are different, imbalance of output converter current will occur. When connecting two converters in parallel, the +Vout signals should be tied together with a low impedance connection by a large plane type connection of the circuit board. The same configuration should be implemented for the –Vout signal. When redundancy is required or when 3 and more converters are connected, a diode needs to be connected in series with the positive output of each paralleled module. This will prevent a unit that has short failure at the Output from shorting out the entire load. If the Aimtec converters used include a trim option, then output trimming generally is not required in parallel configuration. However, if required, it is recommended to use individual trim resistors on each module. If it is needed, separate fusing at the input of each module is also required to prevent a unit that has short failed at the input from shorting out the input on the other units. This application applies for identical Aimtec part numbers of AC-DC Converter(s) or multiple DC-DC Converter(s). The system shown is Figure 2 is used with an AC input and a DC input from a battery. Together the two converters form an Uninterruptible Power Supply (UPS) and are used as a battery back-up in the event of an AC power interruption. Both converters have the same output voltage and power, with their outputs connected in parallel through decoupling diodes.